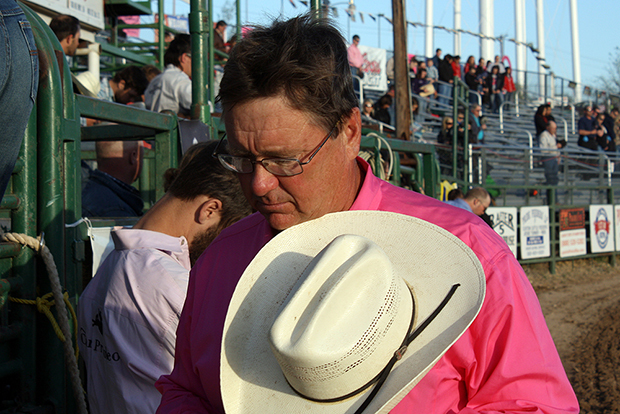 John Gwatney bows his head in prayer prior to a recent rodeo performance. Gwatney and his wife, Sandy, are a big part of the Pete Carr Pro Rodeo family. NACOGDOCHES, Texas – When Pete Carr established his rodeo company years ago, he knew he needed a great team of talented people to help him along the way. “Everybody knows their job, and everybody knows where they need to fill in if something goes astray,” said John Gwatney, the production supervisor for Pete Carr’s Classic Pro Rodeo, the livestock firm that will produce the Nacogdoches ProRodeo & Steer Show, set for 7:45 p.m. Thursday, March 27-Saturday, March 29, at the Nacogdoches County Arena. “The thing about John and Sandy is that they’re very good at everything they do, and they’re very selfless,” said Pete Carr, owner of the Dallas-based livestock company. “They have been with us since the beginning, and they are an integral part of making each of our rodeos work. At the heart of Pete Carr Pro Rodeo is family. It’s what makes everything click.